If you are reading this you are no doubt one of the millions(?) of hunting & fishing enthusiasts who participate and or browse the many Forums available on these subjects and much more. I am far more a browser than a participant in the many forums out there. Typically I am looking for some specific information on a particular firearm or load data etc. I also enjoy reading and seeing the many hunting stories that people post there. Recently I was compelled to start a post of my own after reading countless people referring to their game being shot and “DRT” (Dead/Down Right There). There just seemed to be an overemphasis on DRT and I simply stated pretty much just that and asked if it was just me or was I making to much of it. There were thousands of views and over 100 replies. They varied from blatantly disagreeing with me to those who stated they would rather aim for the higher percentage target area and didn’t mind “a little tracking job”…some even said that tracking added to the experience. Some included pictures of deer that were clearly shot in the head or neck & some were more or less short hunting stories. This is what I want to point out here today and for the sake of discussion lets use deer as our target. 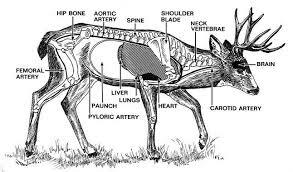 A bullet from the typical deer rifle that strikes a broadside deer high and directly on the shoulder (the high shoulder shot) should not only break one or both shoulders but it should also damage the spine (central nervous system) and the deer drops in it’s tracks. But does this always result in a dead animal? I have a friend who did just that on a deer one year with his 30-30. The deer dropped and never moved. My friend was in no particular hurry to leave his blind as he had another tag and he could see the deer. After a while he walked over to tag & field dress the deer only to discover that although it could not move it was clearly alive, breathing and “watching” him as he walked around it. He quickly finished the job but expressed a bit of disappointment at having left the deer to suffer for so long. Another similar instance happened to me. While bow hunting a coyote stopped exactly on the deer trail I was hoping to ambush a nice buck on. As I came to full draw the coyote turned slightly to look at me with his head down. I took the shot and he dropped right there. DRT or so I thought. When I walked up to it I found that my arrow had hit him just above the right eye and exited almost the center of the back of its head. I know that because the fletching part of the arrow was still inside his skull. If you have to miss your target I guess that would normally be the kind of miss you hope for. In this case I walked up to a motionless coyote that was clearly still breathing. There was no sign that it was aware of me, the eyes were not moving nor was anything else moving but clearly it was not DRT, it was just, there. I quickly finished the job but I wasn’t very proud of myself. The reality is I should have waited for a broadside, high percentage shot but I knew the exact range and was confident I could make the shot. I am still surprised that a three blade Muzzy through the head did not kill the thing. I can only assume the blades hit the exact spot that did all but kill it. The point is, even though you hit the central nervous system there is always a chance the animal is only wounded. We have all heard the stories of the hunter who put his rifle across the antlers of his trophy only to have it jump up and run off with his gun. There is currently a few pics out there of a guy with a very nasty head laceration and a very nice buck. The caption read something like, make sure your deer is really dead before trying to field dress it. My last point on this part of the discussion is the head shot. Several people spoke of having seen or used their tag on a lesser buck that had it’s jaw hanging half off by someone’s missed head shot. I also know of a bow hunter who had a large doe feeding close under his tree stand, he was so confident in his shooting that he decided to shoot her in the head. He was amazed when the deer ran off as if uninjured. His arrow was there with only a few hairs on it. Several weeks later he saw the same doe (ok, probably the same one) walking in that area, one of it’s ears was hanging down along the side of it’s head. His arrow most likely hit the base of her ear and cut through the cartilage all but remove the ear. So much for DRT. Head shots, neck shots and high shoulder shots will all give you DRT. If you hit them exactly where you need to. A miss, and we all do, results in something far from DRT! When we do a hunter safety class or other hunter training class where do we teach the newbie to aim and why? Take the high percentage, larger target, broadside behind the shoulder heart lung shot. If you are a very good shot you will be able to place your shot where it will very quickly drop the deer, usually within sight. If you miss, even by a few inches, hit a branch, flinch or whatever. You are still going to hit a vital area that will almost always result in an easy blood trail. I said almost because I know from personal experience that sometimes they just don’t bleed a lot and other times there is so much blood you wonder how one deer could possibly carry it all. Police officers and personal defense CCP/CCW instructors always teach “center mass” aiming because it gives you the best chance of making a hit that will disable the attacker instead of a clean miss. It’s exactly the same with the broadside behind the shoulder shot. We will all do our best to drop that trophy buck because that is why we are out there shooting at it in the first place. Each of us has to decide if we can make that perfect shot or if we should wait for the high percentage “center mass” target to present itself. It can be hard to pass up a trophy buck when he doesn’t give you the perfect shot but far harder knowing you wounded him and are unable to find him. The featured picture is just one of many available online showing exactly where the vital organs and central nervous system targets are located. Some would even tell you to wait for this deer to take another step as his right front leg is back and covering part of that center mass target area. Far more important with a bow than a gun but it still ups the odds in your favor. What does DRT mean to you?